The biggest challenge for industrial manufacturing companies in the process of digital transformation isn’t the technology—it’s the people. It’s critical not to underestimate the importance of this part of the equation as leaders implement a new era of digital industry. Success will depend largely on the digital IQ of leaders and their teams. Without the right talent, revenue suffers. Manufacturers with the best and most efficient recruitment processes will continue to have a distinct advantage in hiring talent to fill both traditional roles, as well as those roles requiring new emerging skills and knowledge that the younger generation of workers offers. In today’s competitive and changing markets, it’s never been quite as important to get talent “right”. That’s why many forward-thinking organizations of all sizes, specializations, locations and focus are considering flexible, customizable RPO (Recruitment Process Outsourcing) solutions that can be integrated into overall talent strategies. Outsourced or internal shared service recruitment solutions can provide the necessary hiring support structure to select and hire the talent they need—when they need it. 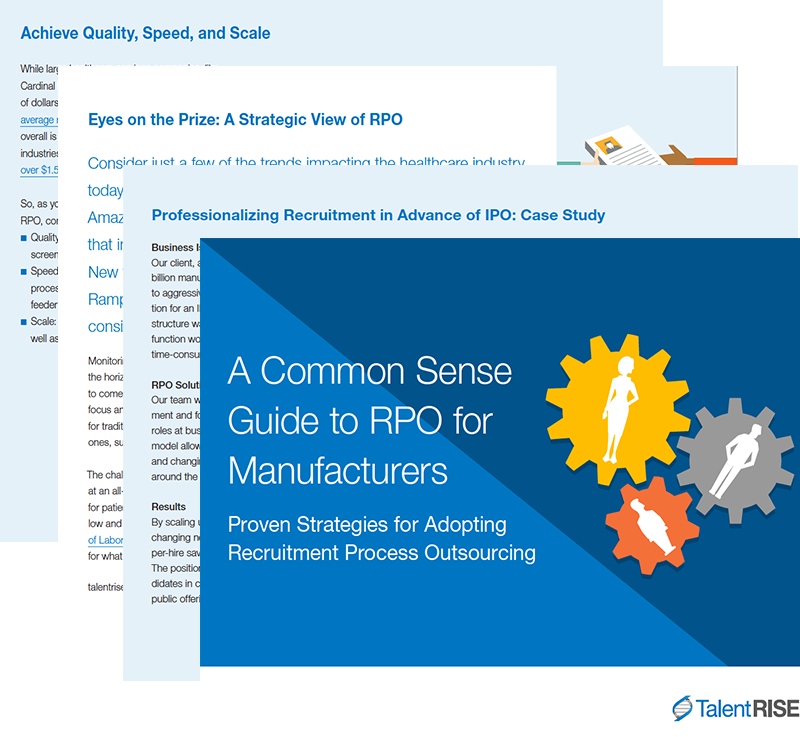 Download the eBook to understand how RPO works and why it might be the best option for recruiting top talent to your manufacturing company.